Full details are in for Guillermo del Toro's 1997 horror flick coming to Blu-ray this September, which is now getting a director's cut upgrade! 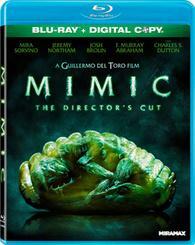 As previously reported, Lionsgate is working on 'Mimic' for Blu-ray on September 27. The film is based on the short story by Donald A. Wollheim and stars Mira Sorvino and Josh Brolin. This all new cut of the film, featuring seven minutes of restored footage, introduces subtle character moments that transform 'Mimic' into a film that Del Toro fans and newcomers alike will embrace as the definitive version. You can find the latest specs for 'Mimic' linked from our Blu-ray Release Schedule, where it's indexed under September 27.